SP River Project Association, Ltd. began in the late 1990's when a group of citizens, a task force created by the Chamber of Commerce, in the Sauk Prairie Area began working on the River Walk Bike and Pedestrian Path through August Derleth Park in Sauk City. Over the years, the group has been able to facilitate the addition of benches to the trail and a memorial to a local citizen, Edna Koenig, who devoted quite a bit of her adult life to the rehabilitation of birds. SP River PAL became a Community Partner to a 21st Century Grant given to the Sauk Prairie School District in 2002. We partnered with them in their/our first year to teach participating students how to build a canoe, and to carve paddles. 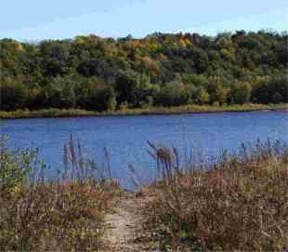 In 2004, we were proud to qualify as a River Management Organization by the WI DNR. This allows us to apply for grants to help us understand the river and it's ecosystem much better, to assist us with the research we need to do to make recommendations to the Villages and the Township on all sorts of river-related issues. We've had other accomplishments too! We've helped the Sauk Prairie Safe Community Coalition produce a River Safety Brochure and funded mini-grants to area classrooms for lessons related to the river. Take some time to view our archives...you'll see several of the projects we've been involved with! SP River PAL is a 501 (c) (3) Organization. Your financial contribution is tax deductible to the fullest extent of the current tax law.